My Ender 3 conversion is pretty much done, just needs some final touches. 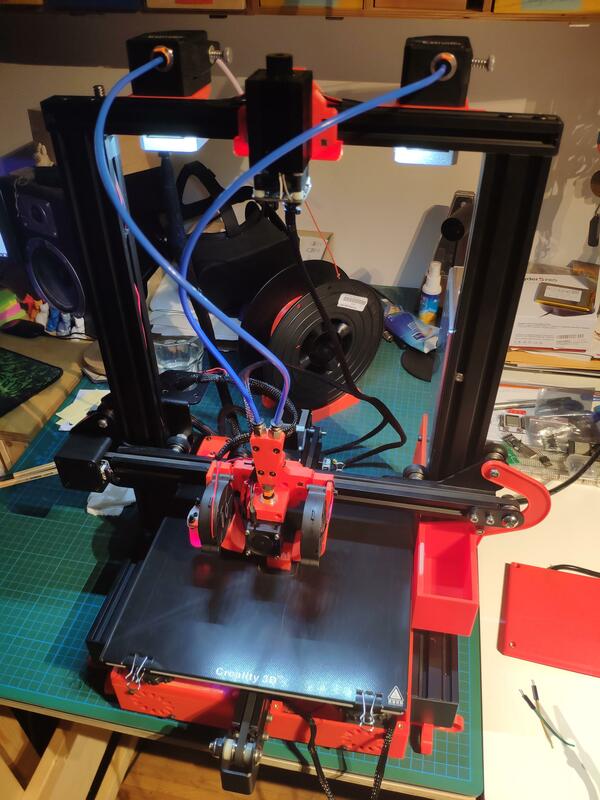 It features a magnetic hotswap tool mount and currently has a E3D V6 with a MaPa nozzle and all-metal heatbreak as well as a 500mW laser. It also has a Y-Splitter for Dual Material printing. Anyways, I got a chance to make my first test print, and while it looks good, there are some weird ripples on the y-axis. For X and Y I'm running identical JK42HM40-1684 0.9 degree steppers. I then tightened my y-axis belt so you can string it like a base guitar string, and the rippels got closer together... How can that be? Maybe a bent motor shaft? 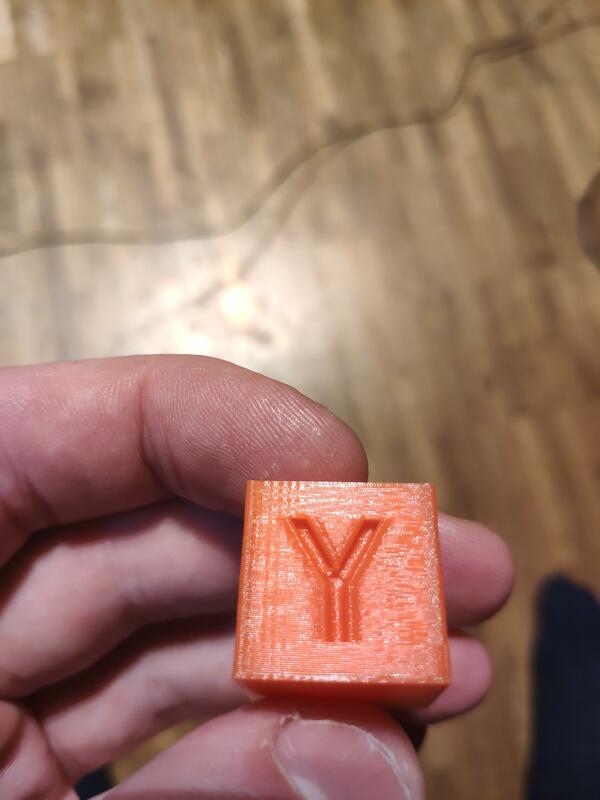 I just finished printing my XYZ cube as well, but I'm honestly baffled, and I really don't know how to interpret these results. I have never seen a texture like this before... I mean, it looks cool, but not perfect the way I want it, and I knew my printer could do better. Not really sure what to make of this? I have calibrated e-steps as well as flow rate. It's the same filament I have always been using. I'm doing 4mm retraction, maybe that's too high for my all metal hotend? Also, my hotend temperature is everything but stable, maybe this has to do with it. Maybe the wierd texture has to do with the temperature fluctuations? ... And finally, some before and after comparisons. Left is before conversion, right is after. Atleast the ringing is gone! It definitely doesn't look gone in your pictures. What acceleration and jerk values are you using for X and Y? Because the weight of X and Y are different, you may need to use different values for each. @phaedrux My config looks like this currently, it's the same values I had with my ender 3 marlin config. Acceleration and Jerk for X and Y are indeed the same. I also didn't print with the glass bed for a while, because I got some bad ringing. But since I fried my BLTouch by connecting it up wrong and my bed is warped as hell, I need to use the glass plate now to get any usable results. But I figured now that I have 0.9 steppers with higher torque, it would get better. Dynamic Acceleration Adjustment is already on my todo list, will try it tomorrow. I also just discovered that both the setscrew inside the left bondtech bmg as well as in the gear on the stepper came loose somehow. Maybe that's the reason for the weird pattern. I've tightened them both, now filament is fed correctly again, it had stopped feeding alltogether. It's too late to start another print now, but I'll try another cube tomorrow and try measuring the ringing and setting up M593. Thanks! The loose grub screw would totally explain the weird texture. For the ringing, the dynamic acceleration link may help you tune it out. @phaedrux The ringing pretty much disappeared now, and it looks much better, so I didn't do anything for the dynamic acceleration adjustment, as there was nothing to measure. However, now I'm getting some weird blobs here and there. Any idea what that might be? 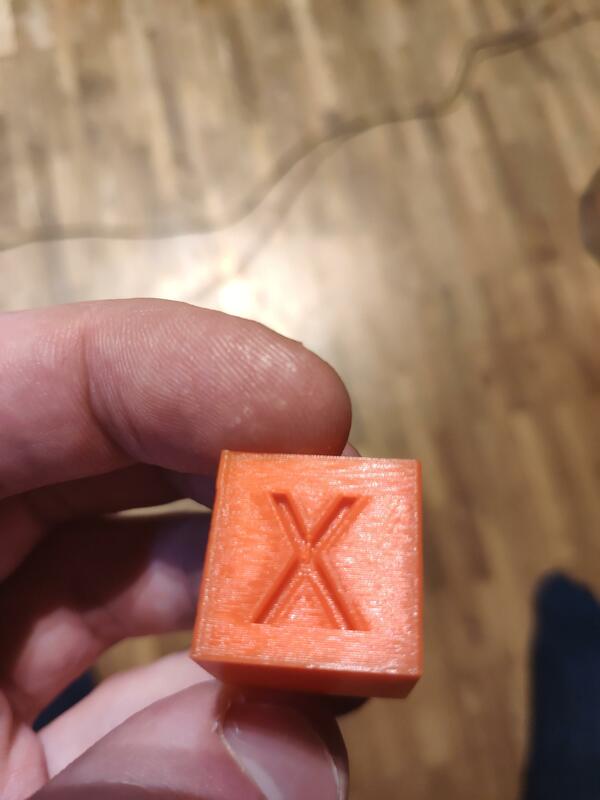 I know I'm also getting some thinner extrusion, always in the same heights, maybe my z-axis is binding. I'll lubricate my z-axis later with some WD-40 Specialist PTFE Dry Lubricant Spray, lets see if that helps. Also, I setup the following macro to help me unload filament from above the y-splitter. However, if I enter all the commands one after another in the gcode console, it works just fine. Any idea what I'm doing wrong? You've found a bug! M302 does not currently wait for moves already in the movement pipeline to complete. So the M302 P0 command is being executed before the G1 E command has completed. I'll fix it in the next release. Meanwhile, insert command M400 before the M302 P0 command. @dc42 Thanks, it works now. 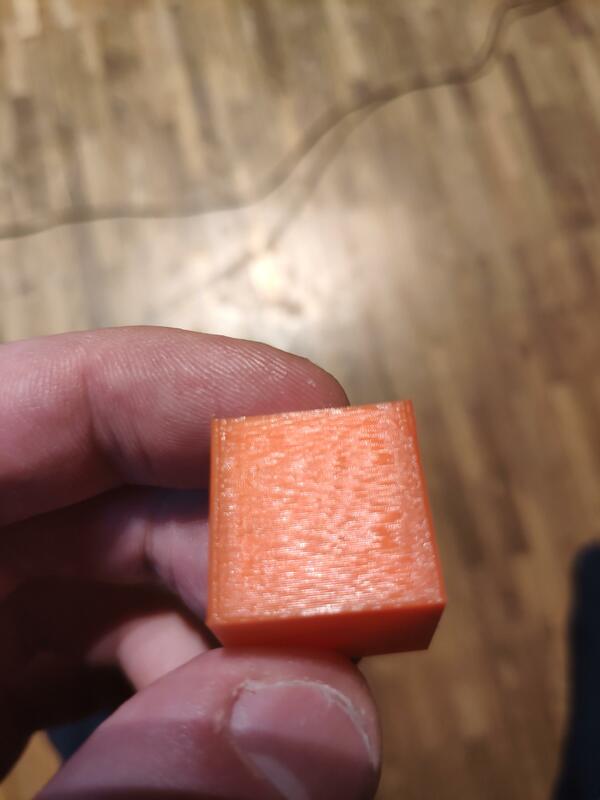 I just tried Dynamic Acceleration Adjustment, because while I was getting no ringing on the hollow 20x20 cube, I'm definitely getting some with the XYZ cube. While printing the upper cube, I looked at the speed in DWC and it showed 30 mm/s for requested and top speed when printing the perimeters. I then measured the distance between the peaks, which is 1mm. So I simply entered M593 F30.0 into the G-Code Console before starting the exact same print again. However, as you can see on the cube below, nothing changed. Did I do something wrong? I've also tried 33.3Hz and 37.5Hz, but no difference whatsoever, they all look exactly the same. Edit: I'm not the only one with this issue. 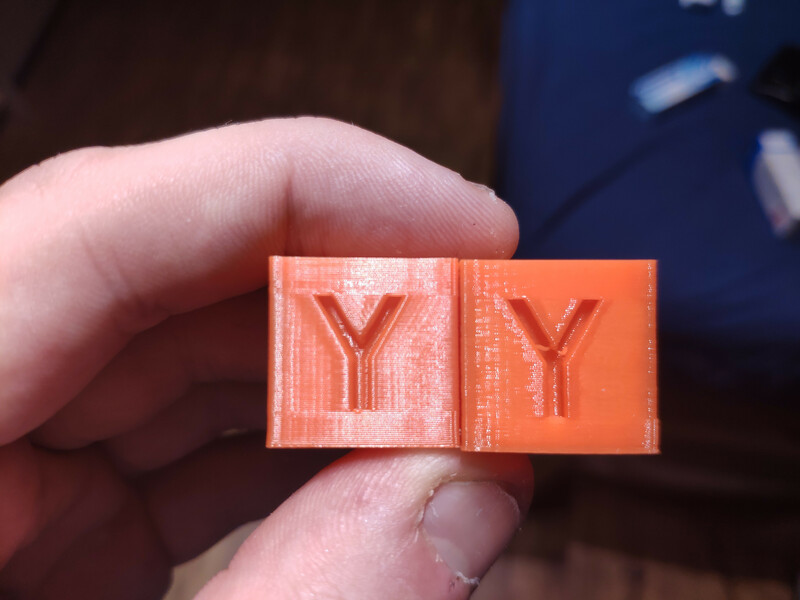 If ones searches for Ender 3 ringing, they'll find tons of posts about ringing on the Y-Axis - but those enders are all stock. Guess it's something mechanical then? I'm out of ideas. I have since upped my accel and jerk and the ghosting got a tiny bit better, but it's still very much there. I'm also currently printing without the glass bed. 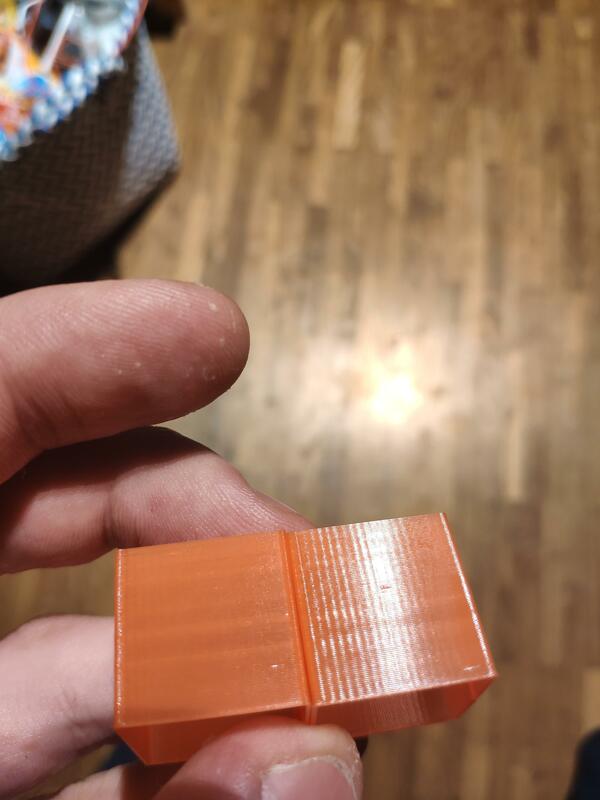 No difference with the cube printed without the glass bed. 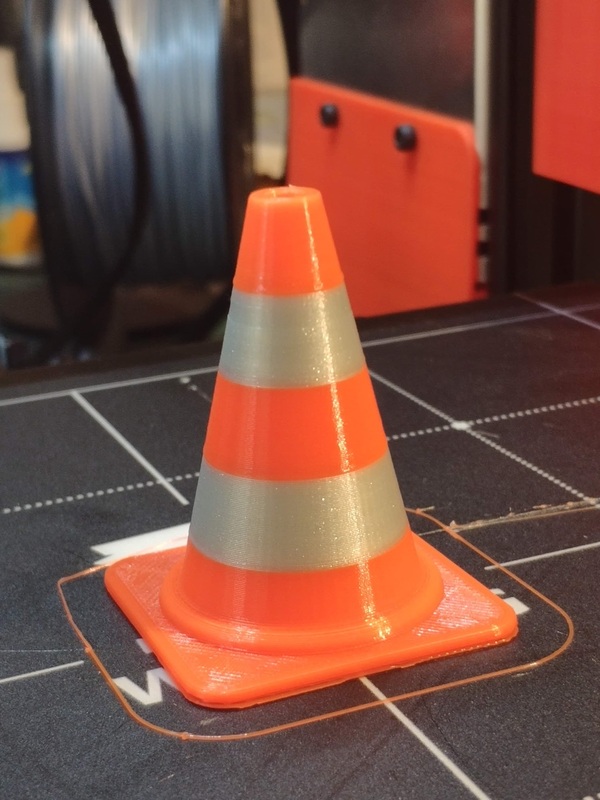 Welcome to the dual extrusion club! Please can you elaborate: what was the problem, and what did you do to fix it? For my first print, I had my z-height slightly too low, so when the printer started printing, the nozzle was too close to the bed. I used babystepping in DWC to make it higher, and that worked for the first layer until a toolchange happened. After the toolchange, the nozzle was too low again (I guess the babystepping was reset, even though it stayed the same in DWC), dug itself in the already printed layer and ultimately caused a clog in my heatbreak. My first guess was that it was caused by a "G1 R1" in my purge_bucket.g macro that was called after purging and cleaning from a toolchange, so I removed it. However, even with it removed, I still had the issue that if there was babystepping before a toolchange, it would not get applied correctly after the toolchange. 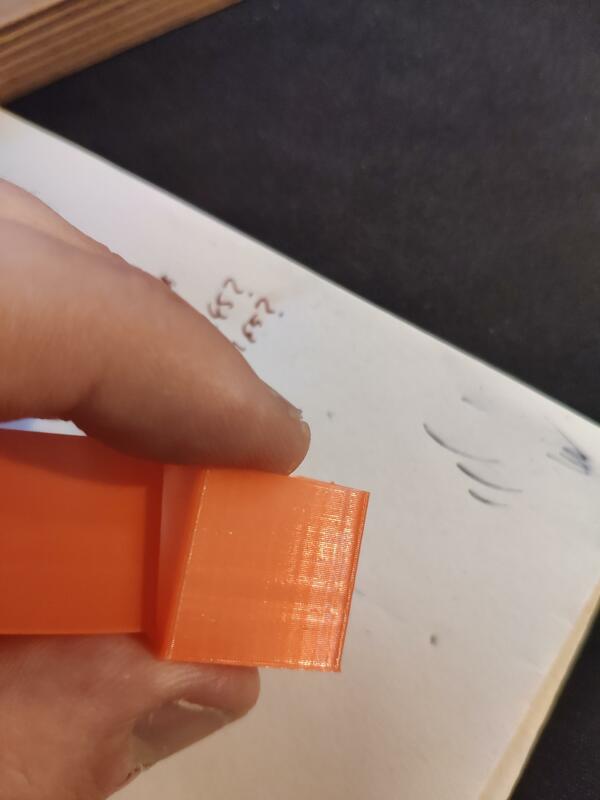 If I had babystepped during the first layer of the first tool, the nozzle would always be too high or too low after a toolchange (causing some clogs in the all metal hotend). I'm also running grid mesh compensation, so maybe the combination of babystepping, grid bed leveling and a toolchange didn't work well together. Or maybe the baystepping get's reset after a toolchange? It stays the same in DWC. The actual offsets (G10) are the same for both tools, as it's the same nozzle anyways. 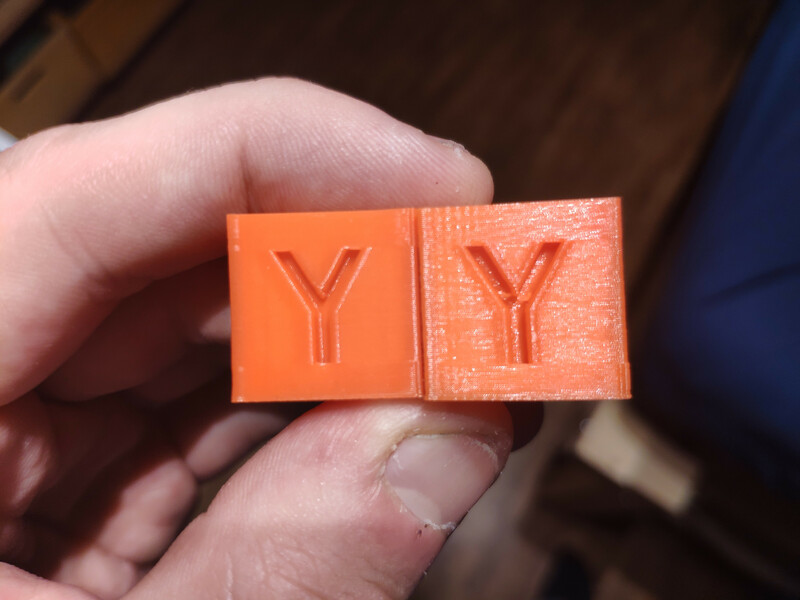 I ultimately fixed it by carefully tuning the z-height before the print so I wouldn't need babystepping. This finally produced the cone above. Im running the latest beta3 btw. @dc42 Just confirmed that the offset it reset when changing tools. I checked by baby stepping up by 4mm, then running a toolchange. The nozzle goes back down 4mm, but it still says 4mm in DWC. I also have a M451 in my tpre0.g and tpre1.g to make sure the printer is in FFF mode, because I have a M452 in my tpre2.g for my laser. Maybe that's the reason? The Bondtech has 50 cogs on the plastic gear. (The gear on the motor has 17.) I have patterns very similar to yours as well. Can you relate the frequency on your parts to 50, each time a plastic cog hits a cog on the motor gear? Do you use pressure advance? Is the amplitude reduced if you increase the temperature 30C ? This would lower the viscosity and reduce the pressure and thereby lowering the force on the cogs. @urban I can only say that the peaks are about 1mm apart in the y-axis, there is no pattern on the x-axis. I'm not using pressure advance. I'll try increasing the temperature next. This is enough to calculate if it is the cogging that is causing you problem.